Buy moyeedoll a Coffee. ko-fi.com/moyeedoll - Ko-fi ❤️ Where creators get paid by fans, with a 'Buy Me a Coffee' button. Hello world! 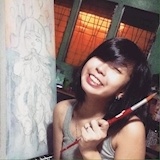 I am Carleen Morgan Guese, an illustrator/artist from the Philippines. I am a super bunny-cat who is on a mission to save all the stray animals in the world. I draw illustrations for books, articles, or anything you can think of in order to support my brood of ten (10) rescued cats and dogs. Anything and everything that I get from my work goes straight to feeding and caring for these animals, if I get to collect more than what is needed for their monthly food fund, I try to help out more of those who are in need. Aside from caring for animals, I also try to make the world a better place one artwork at a time. I draw, paint, and sculpt, You may check out my work at www.moyeedoll.com and follow my instagram (@moyeedoll). If you need anything drawn or painted (as long as it doesn't require being realistic) I can do that, you can also adopt some of my sculpted critters! You may reach me at moreenguese@gmail.com for any questions or if you just want to say hi! Secured Payments. Support goes to moyeedoll's account. Upgrade moyeedoll to a yearly Gold Membership with a one-time payment.